My name is Maddy, I'm 8, and I'm torn between toasted coconut and oatmeal cookie. When we found out who kidnapped the sisters' parents. Well, Sabrina has A LOT of problems, but the one I picked for this question is when she has to escape from an asylum without getting killed by the character who kidnapped her parents. I would try to trick him/her and escape. If you like fairies and dragons, you're gonna like this book! I think it's a good representation of the book. I have! I read the whole series of 8 books because I felt like once I started I couldn't stop. 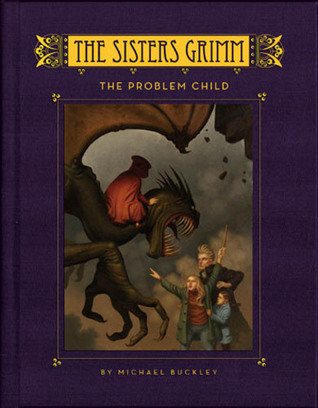 Author, Michael Buckley came up with the idea for the book series after reading an old copy of The Brothers Grimm, where he learned they actually had a sister (who knew?). He soon began imagining the story of Sabrina, Daphne and then came up with the magical setting of Ferryport Landing. But a magical realm needs loads of fairytale characters, so Michael decided to add characters from Hans Christian Andersen, Charles Perrault, and even Shakespeare! For Sabrina and Daphne Grimm, the latest in a long line of fairy-tale detectives, there is one mystery they want to solve more than all the others: Who kidnapped their parents more than a year ago? Sabrina enters the hideout of the Scarlet Hand, the sinister group of Everafters who are keeping her parents prisoner. She has a chance to rescue her mom and dad but is foiled by the most famous fairy-tale character in the world. How can a human child defeat a magic one? With the help of her little sister (who might be tougher than Sabrina realizes) and a long-lost relative, Sabrina finds a powerful weapon for fighting her enemies, and discovers that magic has a high price.